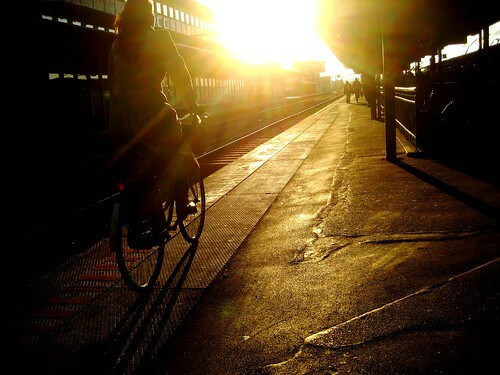 Train Station Bike Riding, originally uploaded by [Zakkaliciousness]. Just moments before this shot she effortlessly lifted her bike off of the Intercity train at Roskilde Station and, knowing all too well that the elevators for bikes and prams was at the far end, she hopped on her saddle and sped off into the sunset to get to the elevator before the army of prams and cyclists arrived. Thanks for the kind words! I know exactly what you mean - there is a beautiful harmony to cycle transport. It's perfection in motion. this photo is absolutely amazing... there's nothing better after a hard day than some good music ao beautiful photos. Stunning picture! I keep coming back to look at it. Thanks for the lovely comments! We do hope you keep coming back.